I have a confession to make. I am addicted to all things fashion related! Since my childhood, I have been inspired and captivated by pretty clothes, shoes and accessories. It is all directly linked to my incredibly talented mother, Chloe, who can create just about anything from a piece of fabric. She and I spent countless hours in fabric stores pouring over patterns and searching for the perfect fabric and trims. We would design a dress and she could put it together with various patterns. She doesn’t sew for me anymore but I still have that same love for fashion and really well made clothing. You can imagine my sheer joy when I was invited to a recent photo shoot for Neiman Marcus here in New York City. It was a combination of three of my favorite things – fashion, Neiman Marcus and New York City. Within the first few weeks of moving to New York City, I was introduced to Georgia Christensen. Georgia had previously worked with Neiman Marcus but brought her family to New York about 10 years ago when she took a job with Victoria’s Secret. As it turns out, Georgia was about to head back to Texas and take over as Creative Director at Neiman’s. In her role, she is responsible for crafting the overall look and feel for the brand and ensuring the creative supports for the marketing objectives of a given project. In January, I met Georgia at Hudson Studios for a Spring ad campaign photo shoot. Hudson Studios is a really neat place where at any given time there can be up to five different photo shoots happening at the same time in various studios. It was exactly what I had imagined the studio would look like. It was spacious, white and well lit. There were lots of people milling around and getting prepared for the shoot. Of course, there was the model, Merethe, make-up artist, hair stylist, photographer, Diego Uchitel and his team of assistants, and the stylist Karina Givargisoff and her team. Producer, Cynthia Cohen from Right Arm Productions over saw the entire crew and made sure everything ran smoothly. From the yummy food down to the booking of the team of creative professionals, Cynthia had it all covered. Georgia developed the overall design and photography direction and under her guidance the crew of creative minds made it happen. The team was working on the Modernist mailer that was sent out to Neiman Marcus customers. As you can see from the photos there were several different looks in the piece. The shoot took place over two days and the final product was really impressive. It was interesting to see the final product knowing all of the work that went into each photo. From the prepping of the model and constantly changing her look, to watching the stylist work her magic in pulling together each outfit, I saw firsthand just how much work goes into putting together a fashion photo shoot. 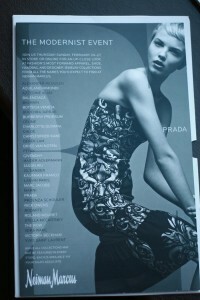 The Prada dress used in the shoot was beautiful and cut to fit a broomstick. Merethe is obviously tall and slim and the dress didn’t even come close to zipping up. No one was sure why the dress was cut to fit a Barbie doll, but from the images you can’t tell that the other side was nowhere close to being zipped. That’s where double sided tape and pins come into the picture, so to speak. The looks in the piece were from many of my favorite designers. There was Celine, Givenchy, Rick Owens, Dries Van Noten, Prada, Lanvin, Roland Mouret and Chanel. And as you can see, the model, Merethe, made each piece come to life, along with some perfectly executed styling from Karina. It also helps that Merethe is close to six feet tall and 19-years-old! So the next time you feel like you aren’t as pretty as a model in an ad campaign, keep in mind that most of them are in their late teens and early twenties and REALLY tall. Youth is clearly still on their side! Good genetics also help, too.